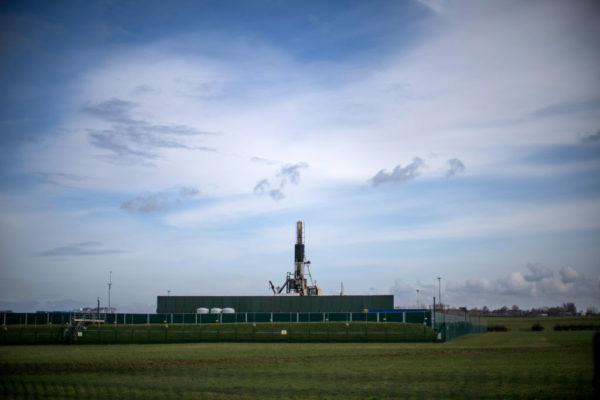 The UK’s energy minister has suggested the government could weaken seismic activity standards at fracking sites, according to documents obtained by Unearthed. In a letter sent to Conservative MP Kevin Hollinrake in July, Claire Perry said the traffic lights system (TLS) the government currently uses to issue alerts of seismic activity is “set at an explicitly cautious level but, as we gain experience in applying these measures, the trigger levels can be adjusted upwards without compromising the effectiveness of the controls”. This comes as Cuadrilla looks to start fracking in Lancashire this week, days after the UN’s scientific body on climate change delivered a special report that warned global carbon emissions need to be halved by 2030 in order to meet the ambition set by the landmark Paris Agreement. In order to achieve this, it suggested natural gas use would have to fall sharply without the rapid and widespread deployment of untested carbon capture technology. Government advisers have previously warned that new onshore oil and gas extraction could jeopardise the country’s legally-binding climate targets. The traffic light system came into effect in 2014 following a series of earthquakes linked to early fracking efforts. 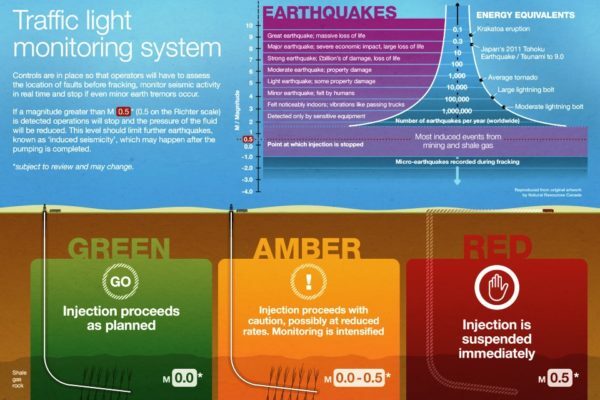 The policy is widely-regarded as stringent, with drillers required to ‘proceed with caution at reduced rates’ in the event of any seismic activity, no matter how small, and to stop fracking immediately if activity exceeds 0.5 on the richter scale. Activity at this level would be imperceptible to households. Industry regulator Oil and Gas Authority (OGA) mentioned this policy in a document on its website in 2017. Hollinrake, MP of the Thirsk and Malton constituency in North Yorkshire, who has supported fracking if well regulated, declined to back the government’s proposal, claiming it was premature. “At this point in time I think we need to know a lot more before I’d support that position. The Traffic Light System is there for a reason,” he told Unearthed. Earthquakes have been linked to fracking in the United States, particularly in Ohio. Much of this has been thought to relate to wastewater re-injection, an activity that is not expected to take place in the UK. However it is also believed there is some link to the fracking process itself. The seismic activity experienced so far in the UK from fracking were sufficiently small to cause no recorded surface damage, but the Royal Academy of Engineering and Royal Society analysed risks from fracking and concluded that damage to well integrity was a hazard. Ed Davey, Lib Dem MP and energy secretary when the TLS was introduced, told Unearthed: “This disturbing news suggests conservative ministers are itching to relax strict fracking regulations without the detailed study, consultations and transparency used to introduce them. Claire Stephenson from Frack Free Lancashire said: “This move can only be beneficial to the fracking industry and not to local communities who are being forced to endure this technology. A BEIS spokesperson said: “The UK’s world class oil and gas regulations, which have a track record of success that goes back decades, will ensure that shale development can only happen safely and in an environmentally responsible way.